Lot Detail - George Washington’s “Superlative Villain” Signs a Receipt for Beacons for Use on the Potomac River at the Start of the Revolutionary War, evocative of Paul Revere's, "one if by land, two if by sea"
George Washington’s “Superlative Villain” Signs a Receipt for Beacons for Use on the Potomac River at the Start of the Revolutionary War, evocative of Paul Revere's, "one if by land, two if by sea"
William Thomas, Autograph Document Signed, Receipt, to John Dent, April 20, 1776. 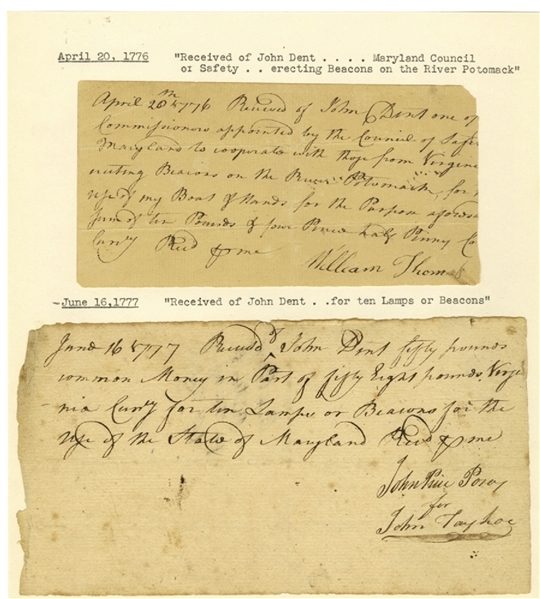 1 p., 6.25" x 3.25"; also John Price Posey for John Tayloe II, Autograph Document Signed, Receipt, to John Dent, June 16, 1777. 1 p., 8" x 4.375", expected folds. First receipt is missing some text on right margin. In full, April 20th 1776 Received of John Dent one of [the Commissioners appointed by the Council of Safe[ty of? Maryland to cooperate with those from Virgini[a in? erecting Beacons on the River Potomack, for [? sage of any Boat & Hands for the Purpose aforesa[id the? sum of ten Pounds & four Pence half Penny Co[mmon? Currcy Recd per me. William Thomas. June 16 1777 Received of John Dent fifty pounds common Money in Part of fifty Eight pounds Virginia Currcy for ten Lamps or Beacons for use of the State of Maryland Recd per me. John Price Posey for John Tayloe. On March 9, 1776, the Virginia Committee of Safety in Williamsburg wrote to the Maryland Council of Safety, “The great length of Potomack River from its mouth to Alexandria where men of war can go & the probability of some attempts being made by the enemy in that Quarter make it prudent in our opinion to erect beacons or signals for communicating intelligence of their approach up the river in a more speedy manner than can be done by land.” The Virginia committee appointed Colonel Hugh Mercer (1726-1777) and Colonel William Peachey (1729-1802) to examine the river and decide on appropriate points for the beacons, and asked the Maryland Council to appoint commissioners to cooperate with Mercer and Peachey. On March 19, the Maryland Council appointed Colonel George Plater (1735-1792) and Brigadier General John Dent to act with Virginia commissioners in constructing the beacons. By April 30, the commissioners from the two states had selected twenty sites, thirteen of which were in Maryland—one in Prince George’s County, nine in Charles County, and three in St. Mary’s County. They also agreed on “the Form of the Alarm-Post, which is to be a kind of Iron Grate suspended by a Chain on the end of a Sweep fixed with a Swivel so as to be turned agreeable to the Wind.” On May 28, Richard Barnes replaced George Plater as commissioner for placing the beacons along the Potomac.